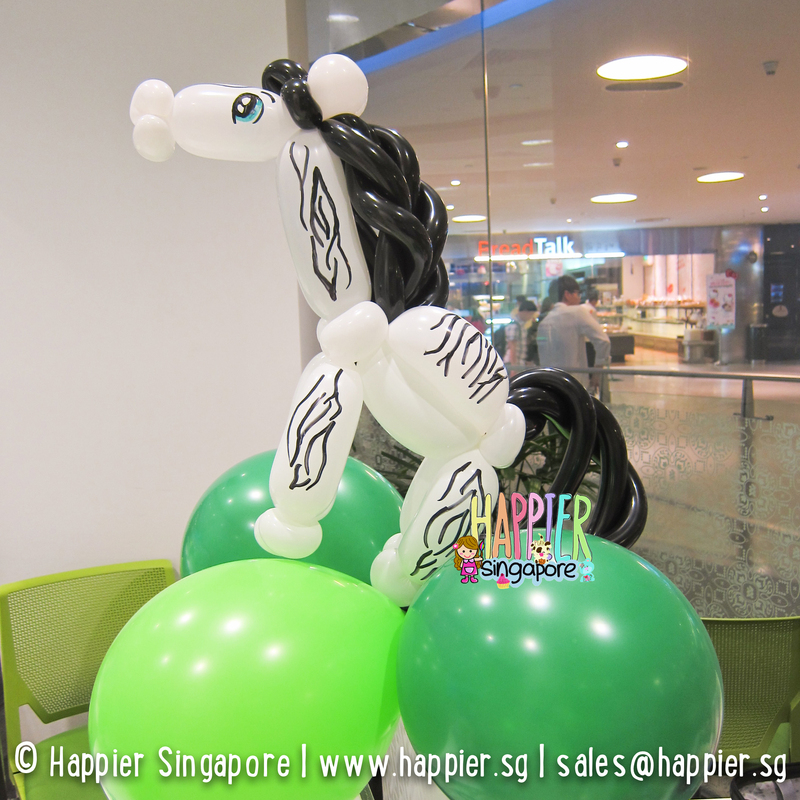 Baby steps towards Balloon Sculpting & Balloon Decorations for Special Occasions | I Paint and Twist Anything! 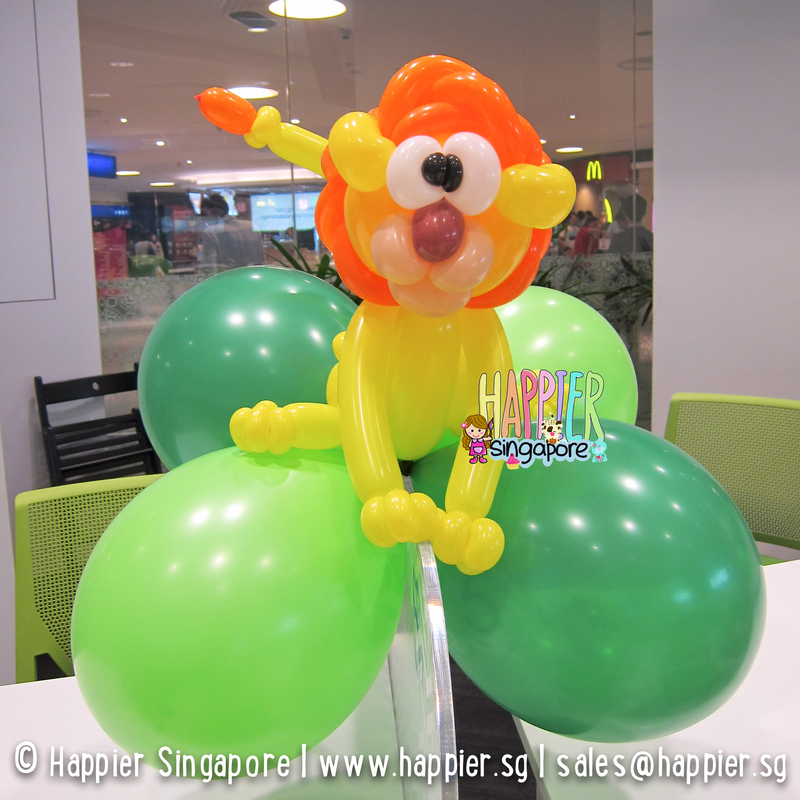 Balloon twisting has been just as exciting a journey for me as face painting. 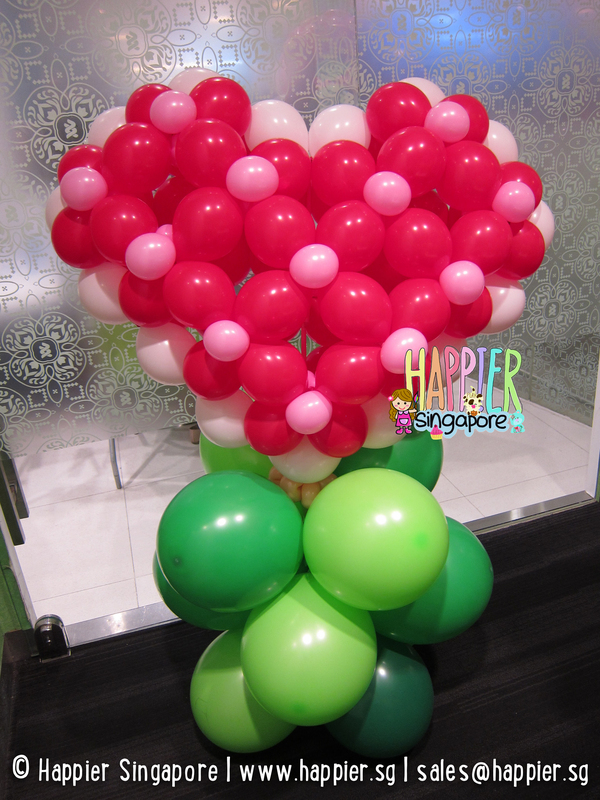 Slightly more than a year back, I didn’t even know the technical name of balloon twisting was called balloon sculpting, hence the name of this blog. I won’t deny it’s tough to twist balloons. 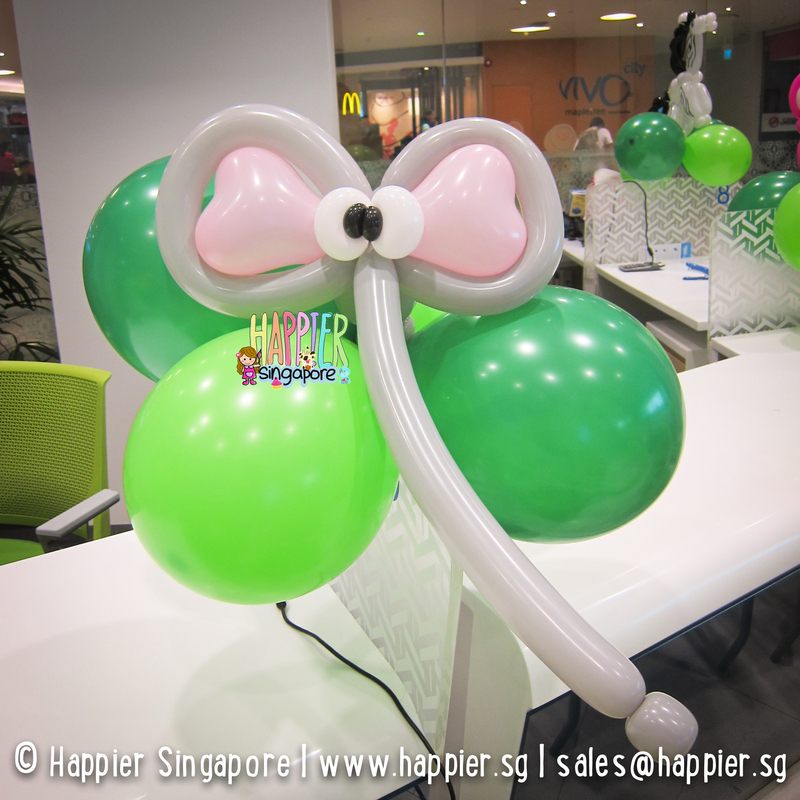 Balloon sculpting definitely helps you work out a sweat compared to face painting. 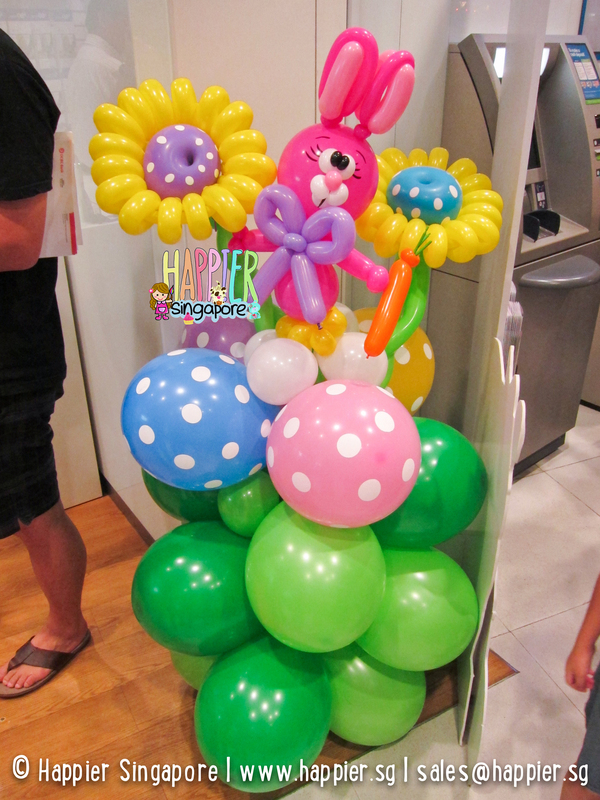 So far, a year of being a wannabe balloon sculptor who is really a face painter in disguise has been pretty fun too. 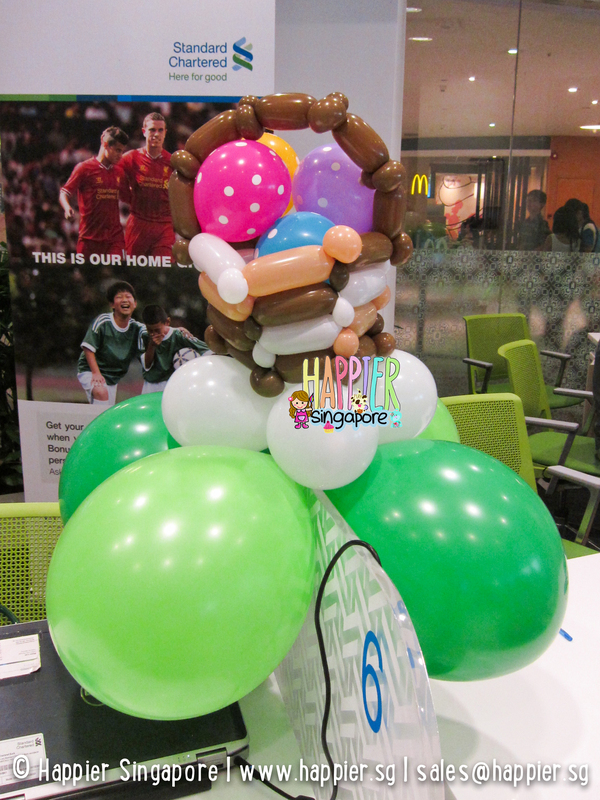 The balloon sculptures below are my baby steps towards injecting a bit more creativity. Mom says I’m insane because I dare to try something I’ve never done before. I secretly know she is excited to tag along or have a hand in the balloons too. Guess we both love novelties. When we get home from a balloon decoration gig, Mom always has twice the energy to narrate to Dad on her adventure in full animation. If you read far down enough, you’ll find out I launched Happier Singapore on 3 April 2013, to celebrate my mom’s birthday and parents’ anniversary. 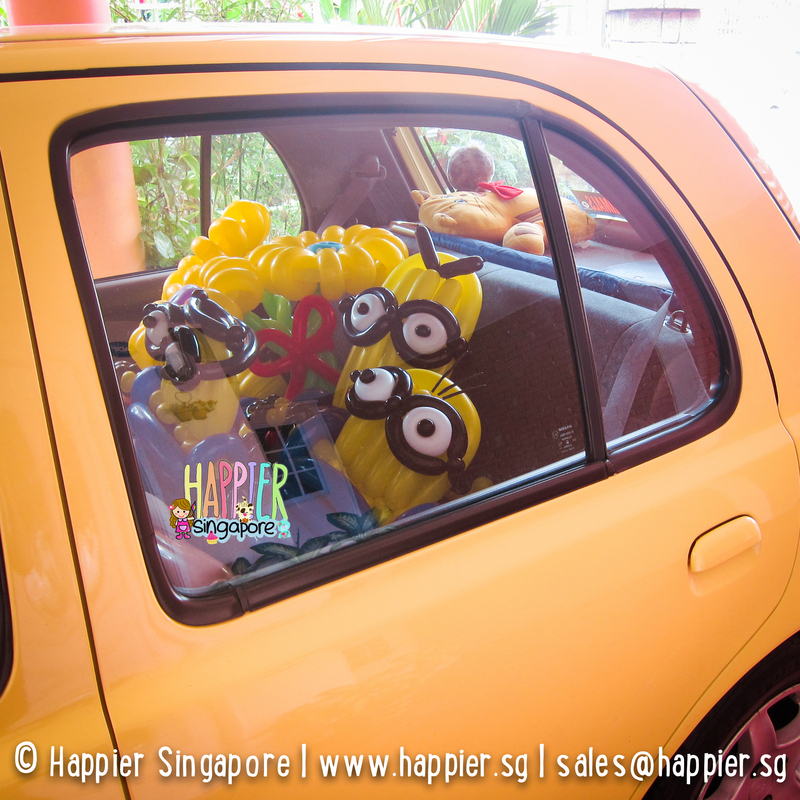 On Valentine’s, we received a special order for a despicably cute surprise. 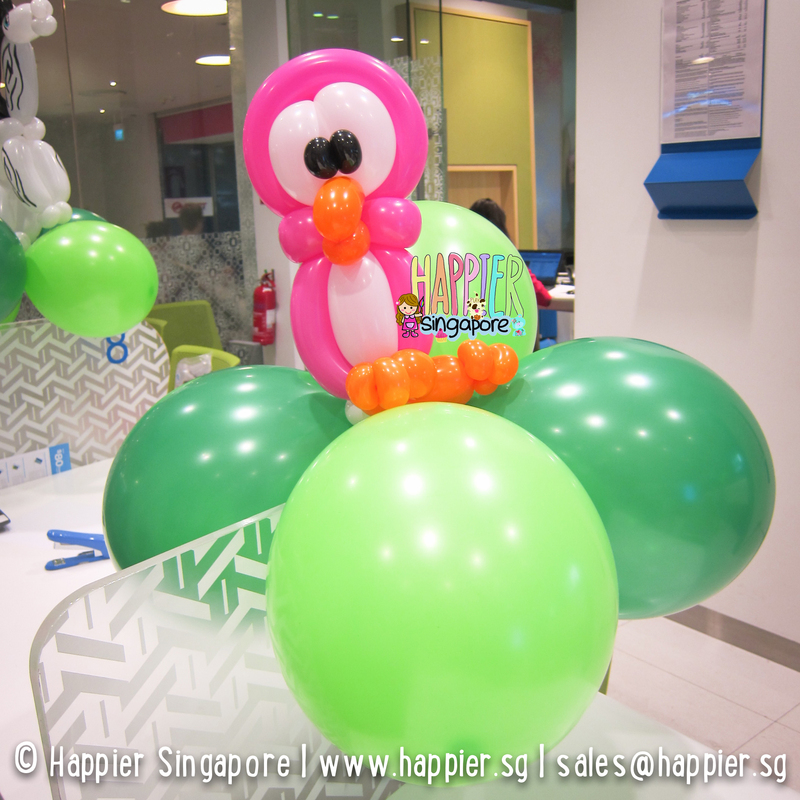 We found a way to sculpt the balloons in a way you can easily tell who each balloon sculpture was. 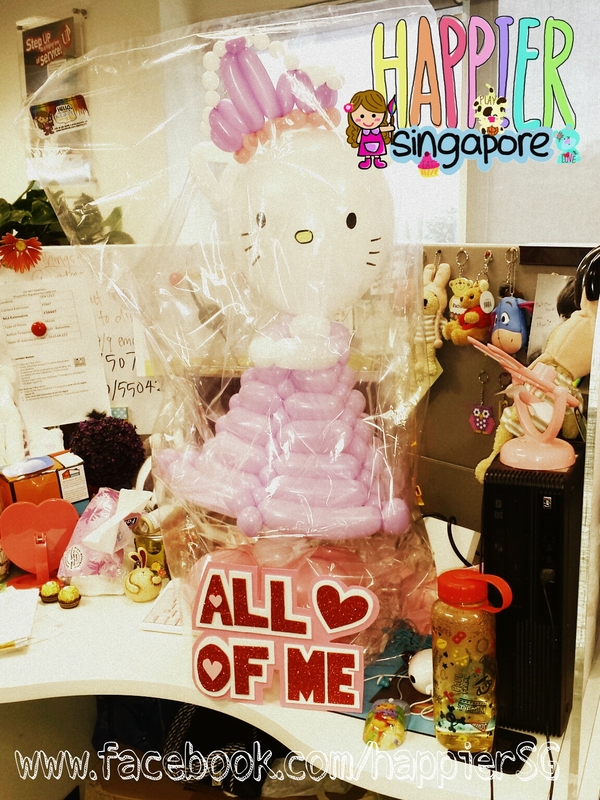 And the client’s friend ended up adding a Princess Kitty balloon sculpture as well. 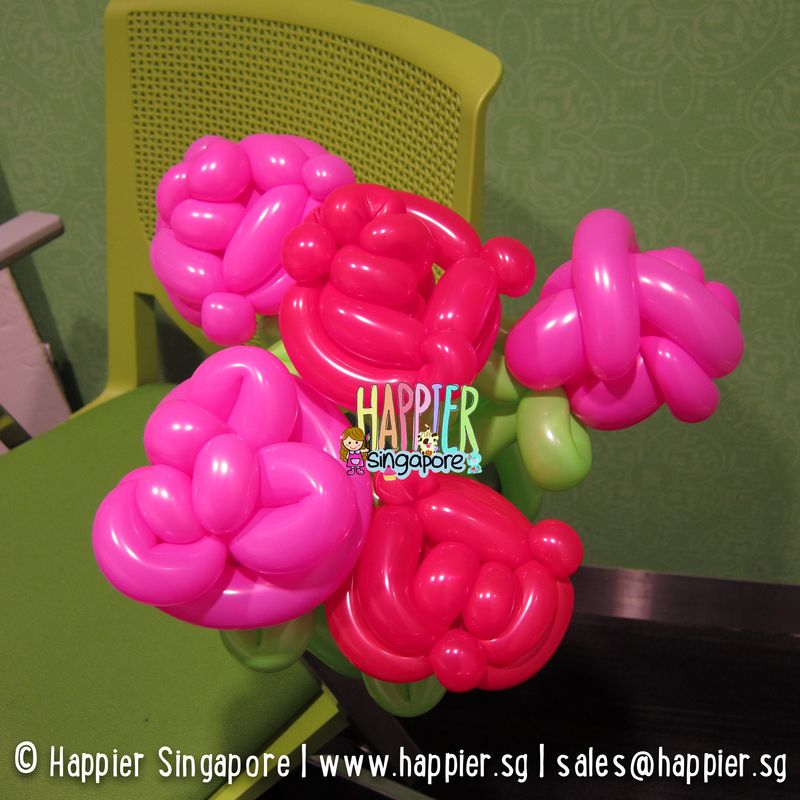 We ninja-ed our way into their girl friends’ offices and planted the Valentine balloons on their desks over lunch hour. 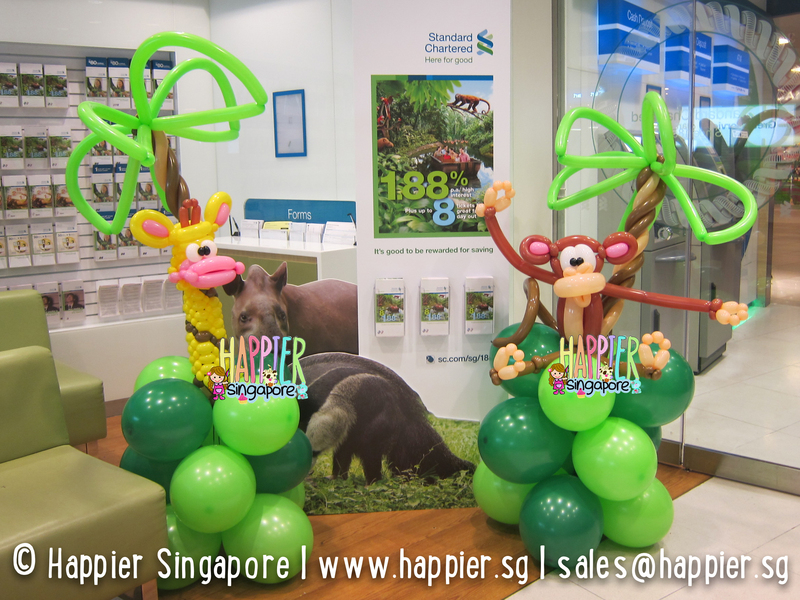 And left the cheeky balloon giraffe and monkey to lure the kids in from the doorway. 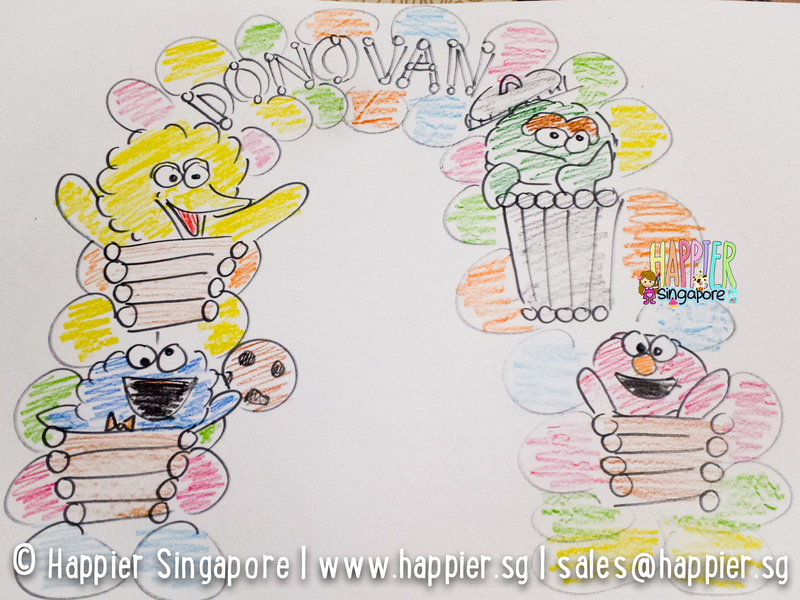 Donovan’s mommy asked us for ideas on for his baby 1st month party. 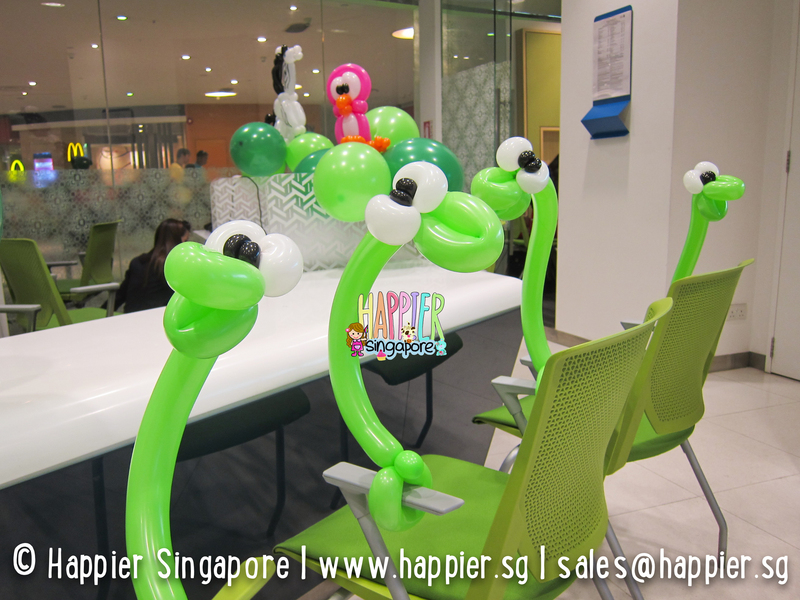 She booked a couple of other services with us, so to thank her for that, we put in extra effort for her balloon decorations. Here’s our balloon twisting ideation process. From paper to reality. 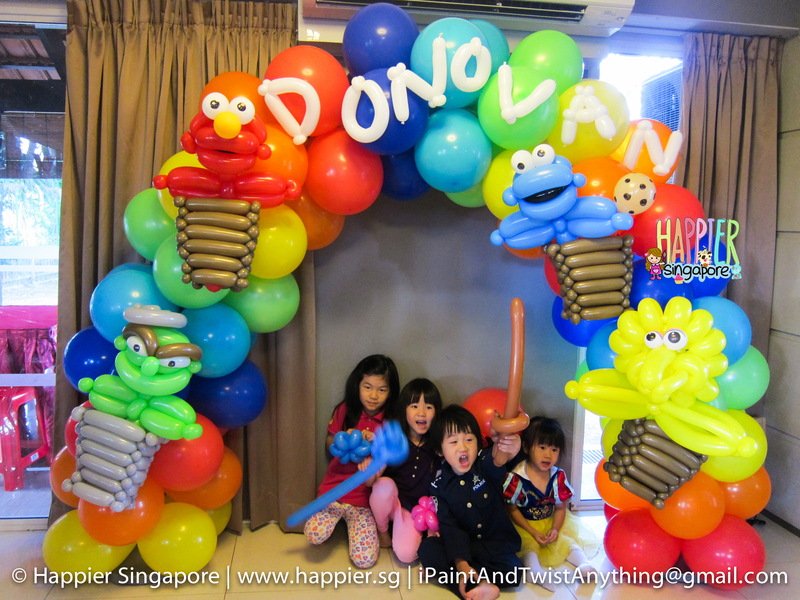 There wasn’t much space indoors so we settled for a miniature sesame street inspired balloon arch with the cute characters sitting in carriages. 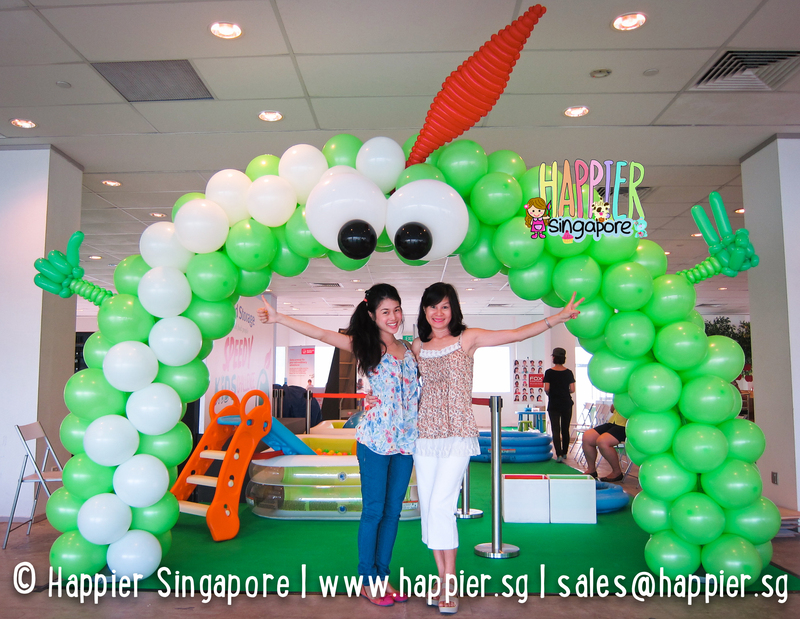 And here’s a customized balloon arch we setup for Cold Storage Kids Run 2014 fun pack collection. 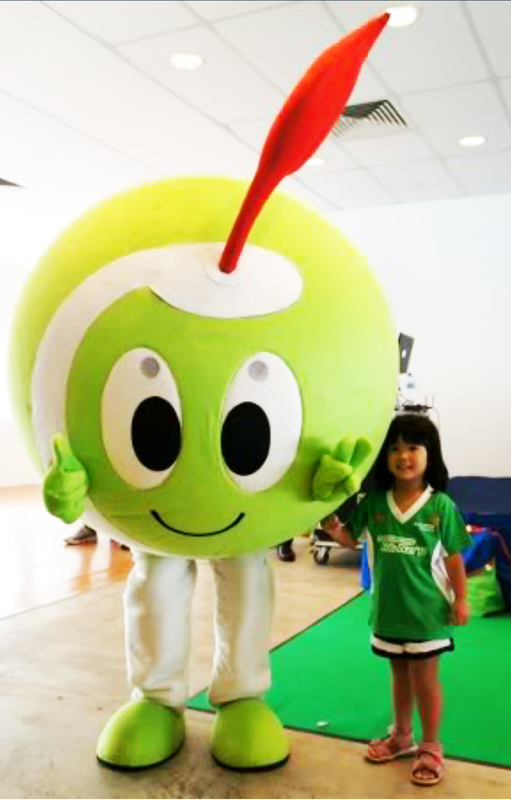 Did you know Cold Storage has a mascot? Here’s how we turned Appleton into a giant balloon arch. Photo credits of the original Appleton mascot to mommy blogger, Delphine. 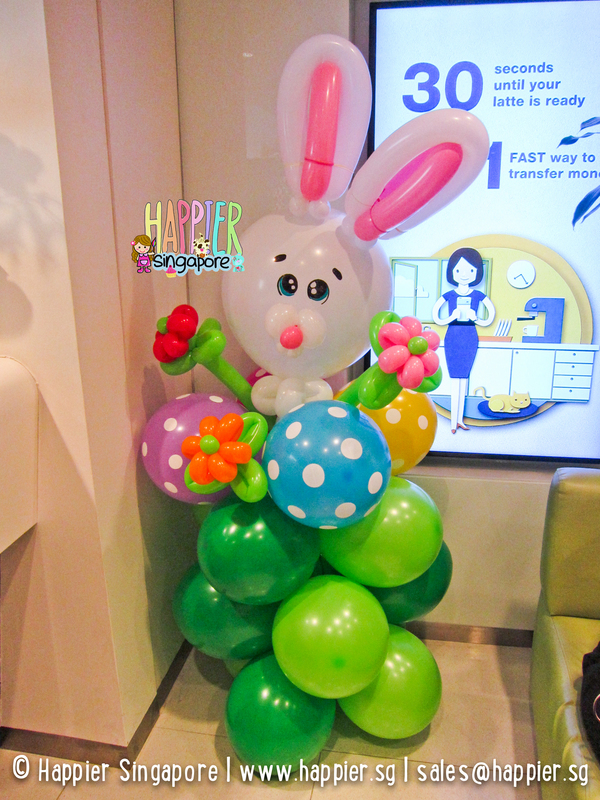 Then Easter arrived in April and we twisted some Easter bunny balloon decorations. Have you ever wondered why bunnies came out of Easter eggs and not chicks? 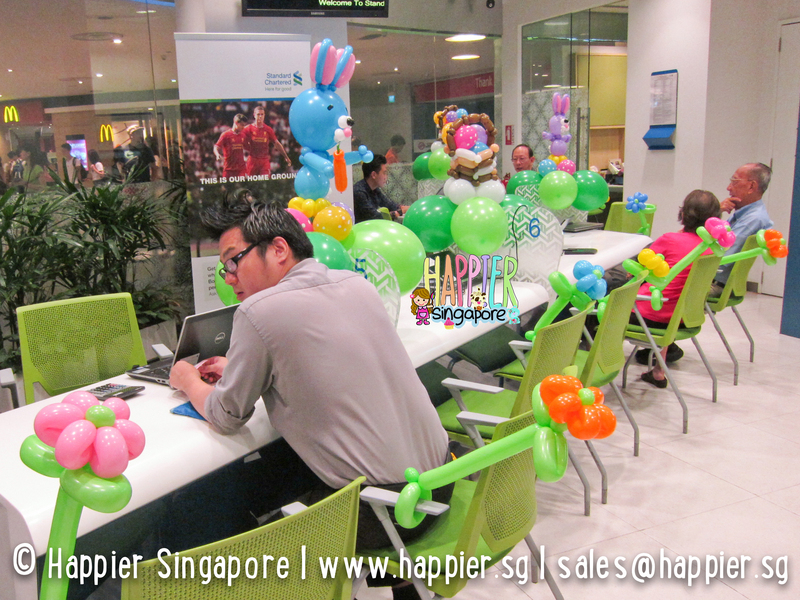 We decked the place with chubby balloon bunnies and polka dot balloon easter egg baskets in happy rainbow colors. 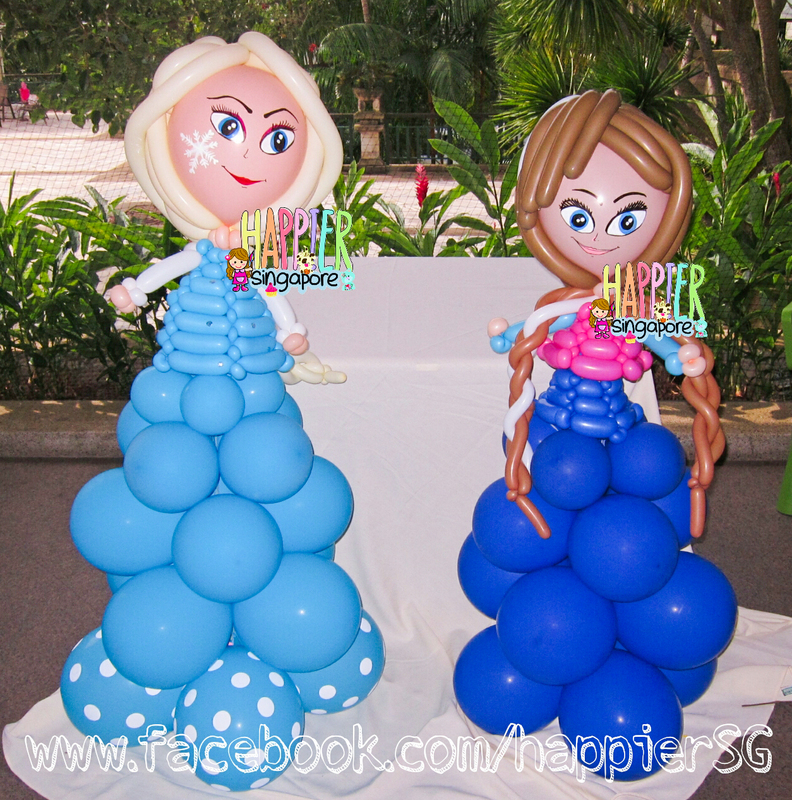 And the next Mother’s Day balloon sculptures, we dedicate to all the mommies reading our little blog. 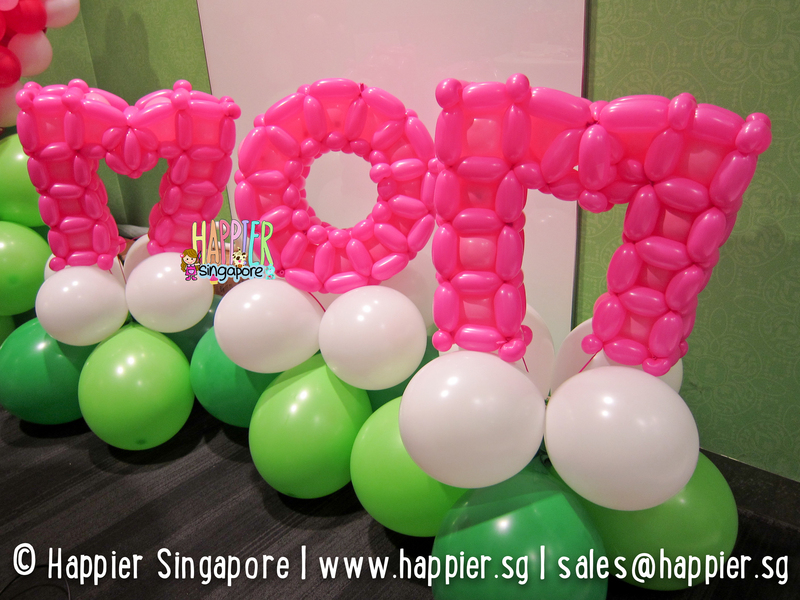 Balloon sculptures of a mother carrying her baby, MOM in 3D balloon alphabets, balloon roses and a super huge puffy balloon heart. Not forgetting to all the daddies reading this too, you’re a rarity of sorts to be planning your child’s party! Hope you had an awesome Father’s Day this June. 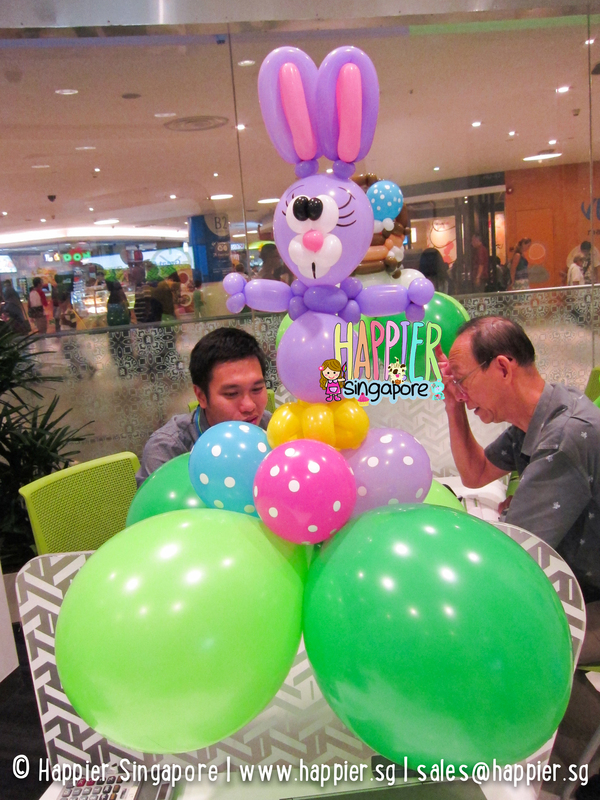 We dedicate this Father’s Day balloon sculpture to you. 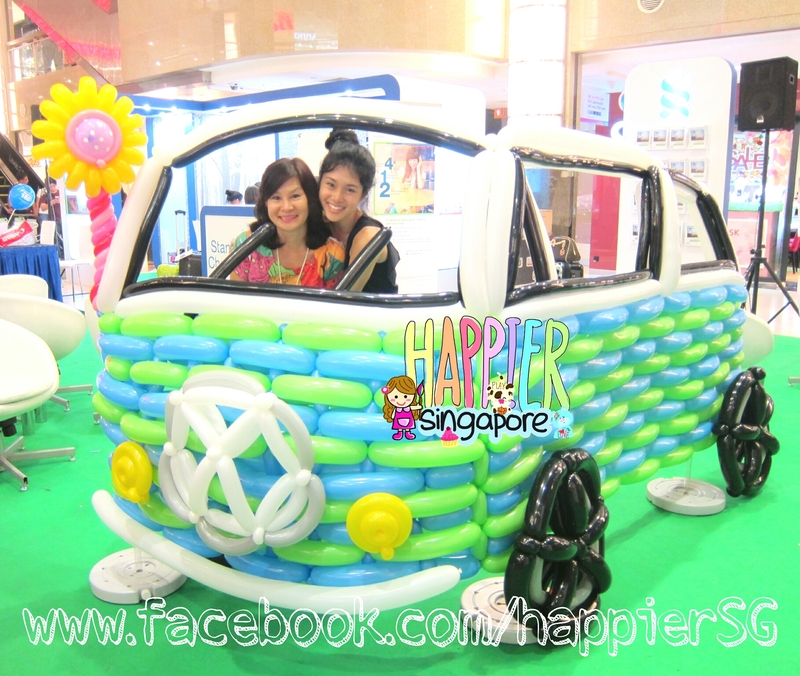 A vintage Volkswagen combi car balloon sculpture with a twist. We weaved in our client’s corporate colors and their balloon decorations doubled up as a pretty interesting photobooth prop for their retro-themed roadshow. I think you would have already guessed by now which is the one design we’ve got the most requests for. 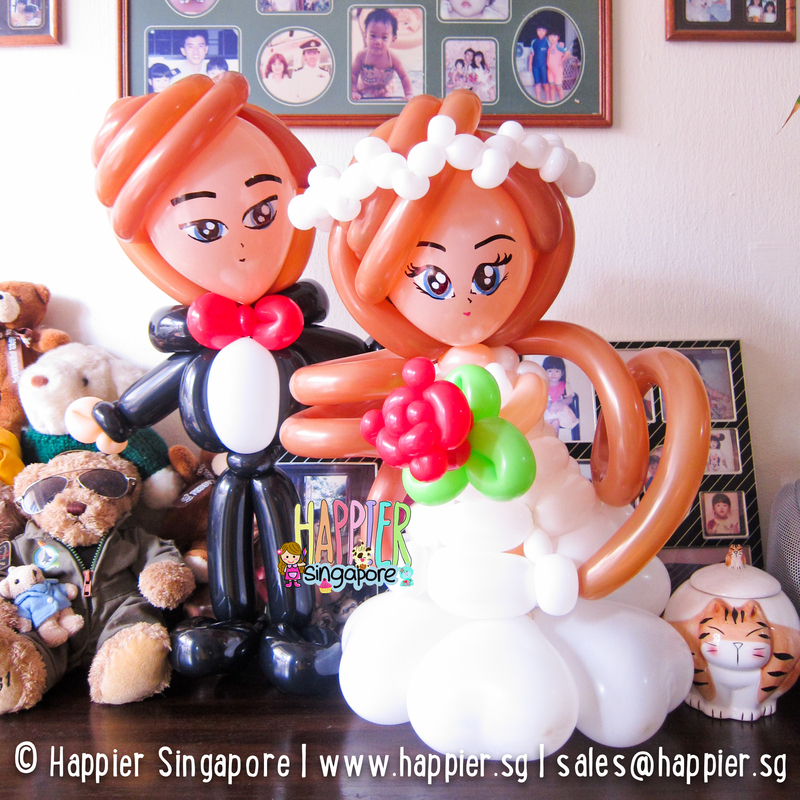 And I just wanna share a happy piece of personal news to end off our first blog post on balloon twisting, JS and I are getting married this 18 October 2014. Nonetheless, you’ll be glad to know the rest of the happier team will still be around to celebrate your parties and special occasions while I’m caught up with the preparations. 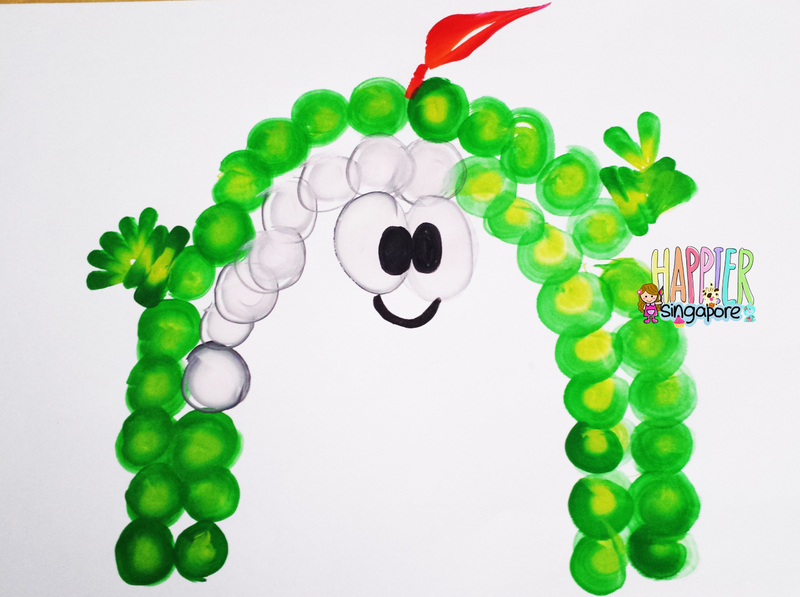 This entry was posted in Balloon decorations, Balloon Twisting, Events, Face Painting and tagged balloon arch, balloon decorations, balloon sculpting, balloon sculptures, balloon twisting, balloons, face painting, kids parties, kids party, kids party ideas, party planner, party planning. Bookmark the permalink.